When I decided that cornbread might go well with the Lucky Chili instead of the brown rice I had been eating with it, I realized I didn't have any cornmeal in my apartment. So I trekked on down to the grocery store and bought some Bob's Red Mill 100% Stone Ground Whole Grain Cornmeal (medium grind). This is the good stuff--it still has the germ and the bran. I don't know what put the thought of cornbread in my head. I'm not the biggest fan--it's usually dry and stale from almost the minute you take it out of the oven. I've had good cornbread, but I've never been able to make it. But once I got the idea in my head, I couldn't get rid of the thought that it would be a definite improvement over the rice for the chili. Since I'm not overly fond of my recipe, I decided to check out my cookbooks to see if I could find something different. Before going to my bookshelf, however, I picked up the package the cornmeal came in. Sure enough, there was a recipe on the back. And it even called for whole wheat flour, which I was planning to use anyway. What the heck, right? Guess what? It's good. It's a little dry, as is most cornbread, but it's also soft and has some moistness at the same time. I think this will become "my" cornbread recipe from now on. This cornbread is truly golden, too. I don't know if you can tell from the pictures, but it isn't yellow at all. 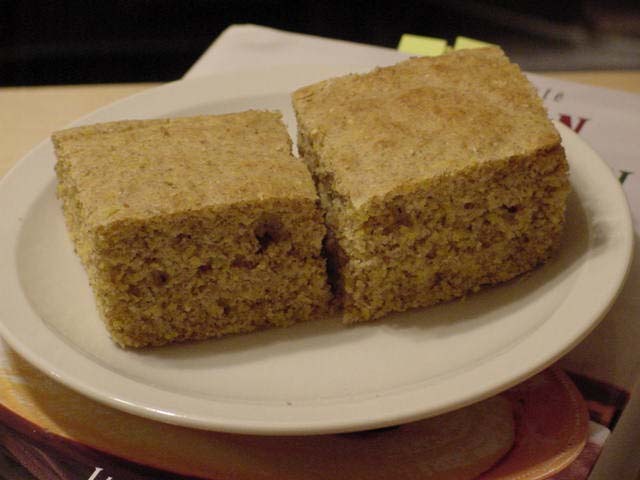 It still looks like cornbread, but the whole wheat turns the yellow into gold. I omitted the (optional) sugar. I fall squarely into the "not sweet" camp when it comes to cornbread. I also used canola oil instead of the softened butter. Sift together dry ingredients. Add eggs, milk and butter. Beat until smooth, about 1 min. Do not overbeat. Bake in greased 8" square pan for 20-25 mins. at 425 deg. 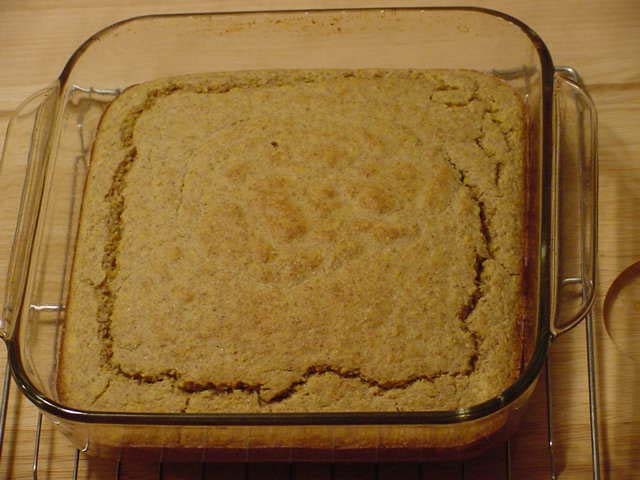 from Bob's Red Mill 100% Stone Ground Whole Grain Cornmeal (Med. Grind) package. It works, but if you go overboard it is sticky and too sweet. I'm sure that would do the trick for the moistness issue, but any sweet in cornbread is too sweet, as far as I'm concerned. Hmmm, If it's the carbonation, maybe club soda would work.